I have this really old planter that had this horrible blue color which crashed with all of our other decorations. I couldn’t stand it any longer and decided that the planter needed a long overdue update. I mean why throw it out if you can give it a neat update in less than two hours, right? I love such easy upcycling tutorials and I can’t wait to share this project with you guys! I bought some rope a while ago at a hardware store. Just because I liked the natural look and feel of it. But I wasn’t sure on what to use it (yet). You ever bough stuff just because you thought there might be a DIY project waiting to be made with it? This was one of those occasions. I wrapped it around the planter and had to realize that it was just slightly too short to fully reach to the top. Sigh! So I had to come up with another idea to cover the inch of blue that was still visible above the rope. Cover the top part of the planter with the copper colored paint. Color about an inch or two all the way from the top. Make sure to also color the edge and a little bit of the I side of the pot. Let it dry for about an hour. Use a hot glue gun to attach the rope to the planter. 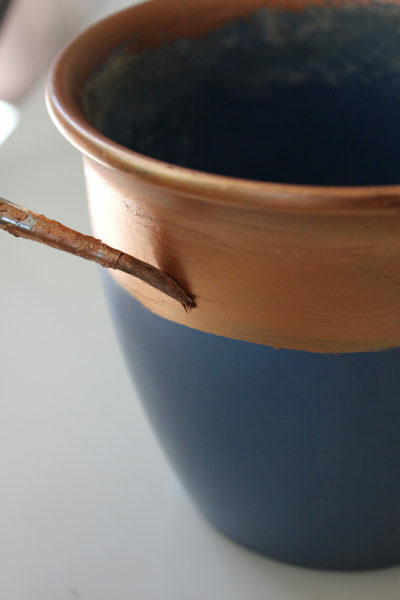 Start at the bottom and wrap it all the way up to the point where you want the copper paint to stick out. And that’s it! I’m super happy on how the update on the planter turned out. Plus it cost me like 4€ in total! What do you think?